I think the best thing that happened to me this weekend was my mother eating at least 15 of these Mini Taco Cups. Whenever my mother praises my food, I’m one proud girl, subconsciously. You know you are a food blogger when the files in your hard disk looks something like this. and you have to take 101 pictures of that damn burger for like 30 minutes before you could devour that same burger in like 0.5 minutes. That brings me to a question. Do you food bloggers, keep a notepad and a pen around you like twenty-four times seven? Or do you guys have sticky notes pasted all over your body? I don’t like to write, thus I do not pen my thoughts but I do love to type though. I have been using color-notes app for as long as I can remember for my schedules, to-do lists, shopping lists and basically almost everything else. If you see a lady in the supermarket, ticking away something on her phone, every-time she keeps something in her supermarket trolley, do say a hi. I may behave weird but I am still nice. I am on the look out for a notebook and shall start scribbling away with hopes on being the next Einstein. 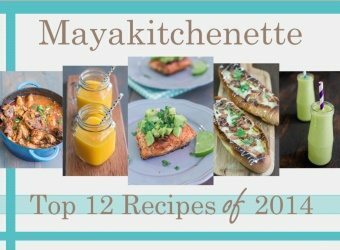 So, I have been wanting to make something Mexican for like 268 months now. 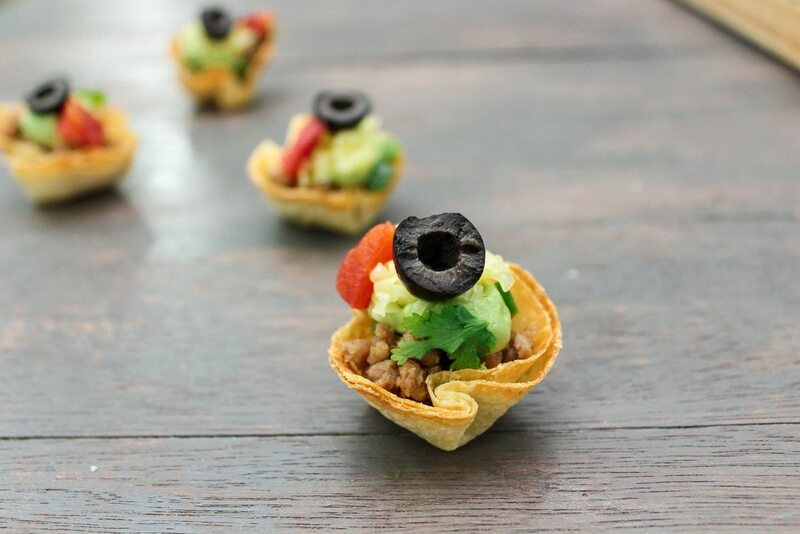 These mini taco cups were the perfect choice and these would make your taste-buds go BAM!! Sour, spicy, creamy, these are really delicious and they taste really fresh. So basically you take a couple of flour/wholewheat tortillas and cut them into circles, depending on the size of your muffin pan. You can use a regular 12 cups muffin pan. I used a mini 24 cups muffin pan and these were uber cute! You can just pop the whole thing in your mouth and these go super fast. After placing the cut out tortillas in the muffin pan, you bake these cups for about 10 – 15 minutes till crisp and golden. Then you prepare the filling. You can really use anything that you fancy. I used avocado, lettuce, green peppers, avocado, tomatoes, cilantro, avocados and ground beef. Did I mention avocado like thrice? Man, that’s NOT enough a mention! 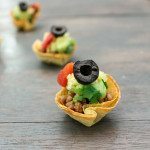 These are best eaten after assembling, else the tortilla cups would lose it’s crunch. If you want to make this in advance, I suggest that you get the filling ready and bake the tortilla cups first. 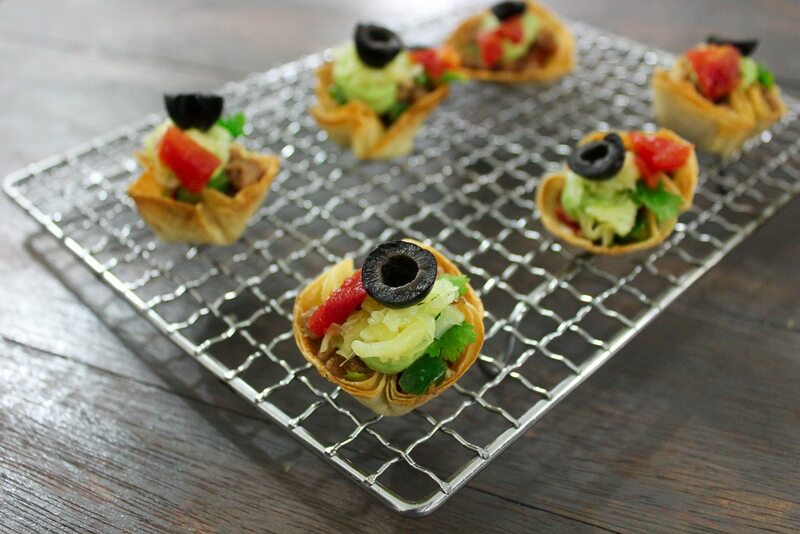 Once cool, store the baked tortilla cups in air-tight containers and assemble right before serving. I did an avocado + sour cream sauce. It is my idea of a 2 minute guacamole. I then topped it with an olive half. Sighs, too cute. If you are not a fan of olives, (WHAT??) you can top these with tomatoes, peppers, or anything else that rocks your boat. I placed the guacamole in a pipping bag and piped it over the babies, without any mess. Easy Peasy! These would make the CUTEST finger food during a party but do remember to make loads especially if you are inviting my mother. 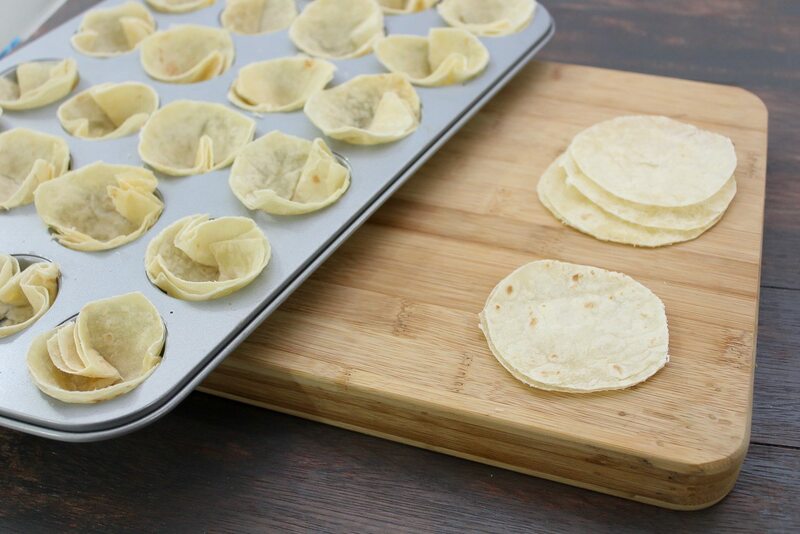 Cut tortillas into 2.5-3-inch circles, for mini tacos. Brush one side of the tortillas circles with butter. With the buttered side facing down, place tortillas into muffin tin. Bake for 10-15 minutes until crisp. In a frying pan, heat up 1 tbsp of oil and saute garlic. Mix in ground beef and cook for 2 minutes. Add black pepper, chili flakes,oregano, cumin and salt. Mix in peppers and cook till meat is done. Set aside. In a bowl, mash up the avocados and mix in sour cream. Add in cilantro and season with salt and black pepper. 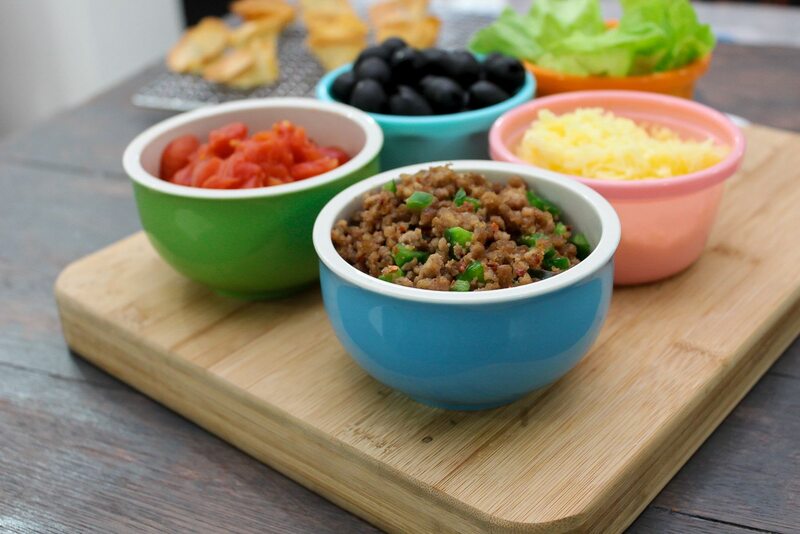 Place ½ teaspoon of taco sauce/bolognese sauce in the taco cups. Top with lettuce, ground meat, tomatoes, cilantro and cheese. 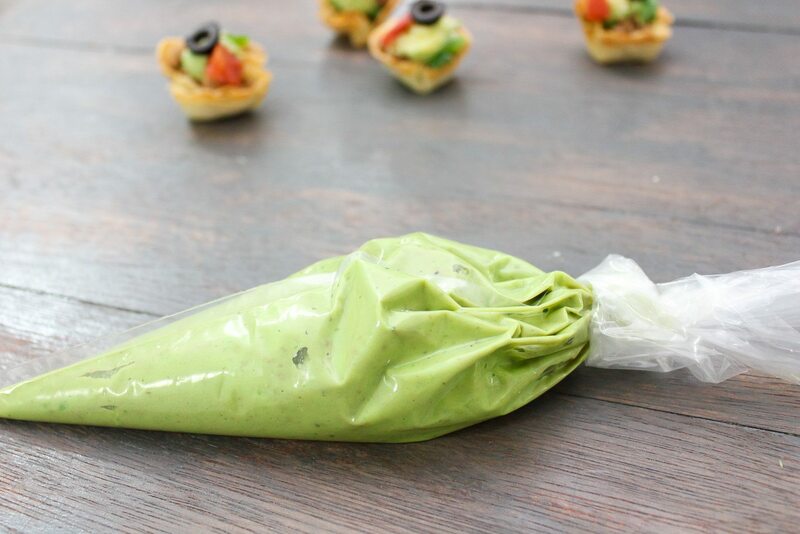 Drizzle some of the guacamole and top with an olive slice. If your tortillas are not pliable enough, you can microwave them for a few seconds so that it fits snug into the muffin pan. For the ground beef, you can really use any spices that you prefer. If you wanna keep it very simple, just go with garlic and black pepper. Looks delicious just at a glance. Going to try this soon. Thanks. Insya-allah ummi akan cuba. Thanks maya.